Supporting the Arts since 1998! Dan Mulqueen is an American multi-instrumentalist from New Jersey. 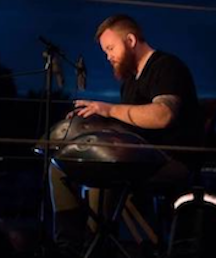 His approach to the handpan has led to a very distinct and recognizable sound which weighs heavily on the side of beat-driven and head-bouncing rhythms. His style comes from over 16 years of drum set playing in genres such as rock, hip-hop, reggae, trip hop, metal, jazz and many more. You can hear some phrasing and rhythmic influences from these genres in the music he creates on the handpans. Dan's songs cross a wide variety of genres and moods all while holding on to some distinct player characteristics. So matter what music you're into, there's probably something for you in his catalog! Jerry Decker originally from Bloomsburg and now from Phoenixville, has been playing drums for over 27 years. 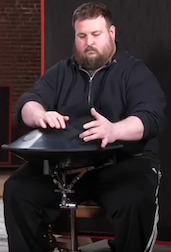 Over the past 2 years, he discovered the newest world percussion instrument, the handpan. He plays it with great sensitivity, passion and joy! 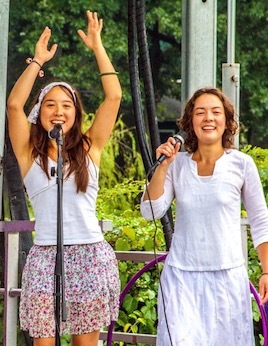 The Armour Sisters embody complementary musical flavors, and have enjoyed singing and playing together in various configurations over the years. Michelle and Angela love the feeling of their “blood harmonies”, and are ever-grateful for the music running through their veins. Their Pop-Pop was a jazz-pianist in the style of Art Tatum. Their father melded his early classical and jazz background with blues, Indian music, and rock and roll to create progressive rock before it was a thing. Their mother is an artist who has always given them inspiration and introduced them to oldies and Japanese music. Michelle and Angela infuse these influences with soul to craft songs, poetry, and heart-based grooves to share their life experiences, insights, and perspectives. Donation of $20.00 welcomed at the door! 24 hr. notice is appreciated for cancellation. Underground at Ron's is a private house concert event that generally happens five times a year, Sept through May, on a Saturday evening & is by invitation only. Friends and family are always welcome! This is also fragrance free environment! Due to my sensitivity to perfumes, cologne's, after shaves, cigarette's, etc., if possible, I ask that you would attend without a presence of those on your clothes, body, hair, breath, etc. Also, when participating in the Community Drum Circle, we request that you PLEASE REMOVE rings, bracelets & wrist watches, if you are playing any of the "house" drums/instruments, to prevent damage from happening to an instrument, hand or jewelry.